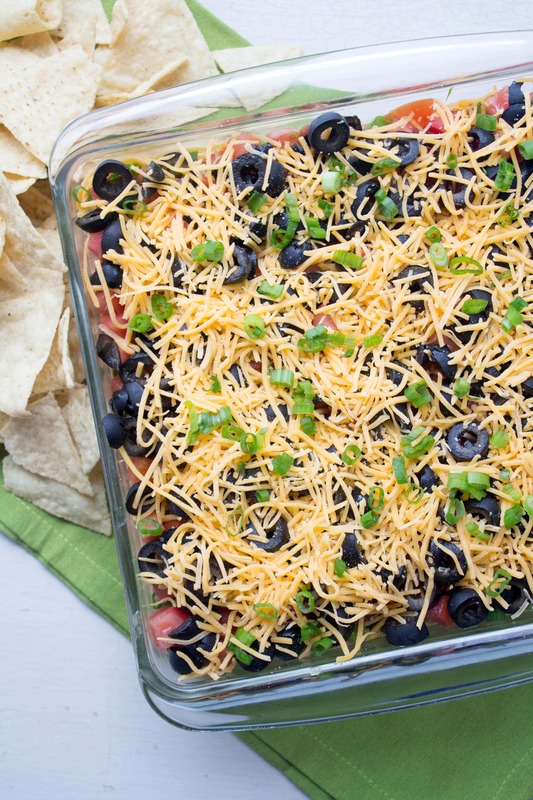 Introducing the best Healthy Seven Layer Dip recipe. It’s easy to make and so delicious! The secret? Using plain Greek yogurt instead of sour cream and mayonnaise! Your friends and family won’t even notice the difference… I promise. 2 cans (9 oz. each) bean dip or 2 cans refried beans — or make your own, or just use canned rinsed/drained whole black or pinto beans! 1. Peel, pit and mash avocados in a bowl with lemon juice, salt and pepper (or put in blender). If you’re in a hurry and don’t have any ripe avocados, you can also substitute 2 containers of mildly seasoned guacamole dip from the refrigerated section at the grocery store. 2. In another bowl, combine yogurt and taco seasoning mix. 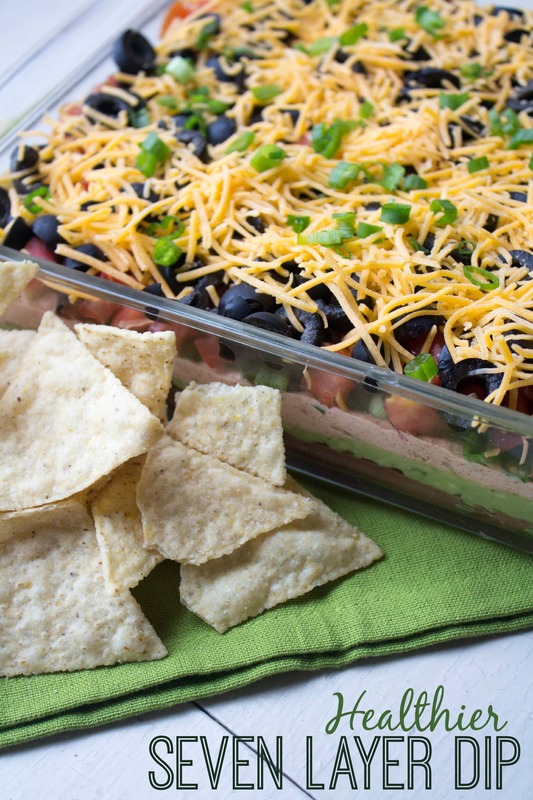 Spread bean dip/refried beans on a LARGE shallow serving platter. Spread avocado mixture over bean dip. Spread yogurt-taco mixture over the avocado mixture. Sprinkle with the chopped green onions, then the tomatoes, and finally the olives. Cover with the grated cheddar cheese. 4. Serve chilled with your choice of corn chips. Enjoy! Want more ideas? Check out this post: Healthy Super Bowl Snack Recipes. If you’re using your own taco seasoning, what is the amount equivalent to one packet? It’s about 1 ounce – in the taco seasoning mix recipe I linked to, just use the original recipe and that’ll be about right! 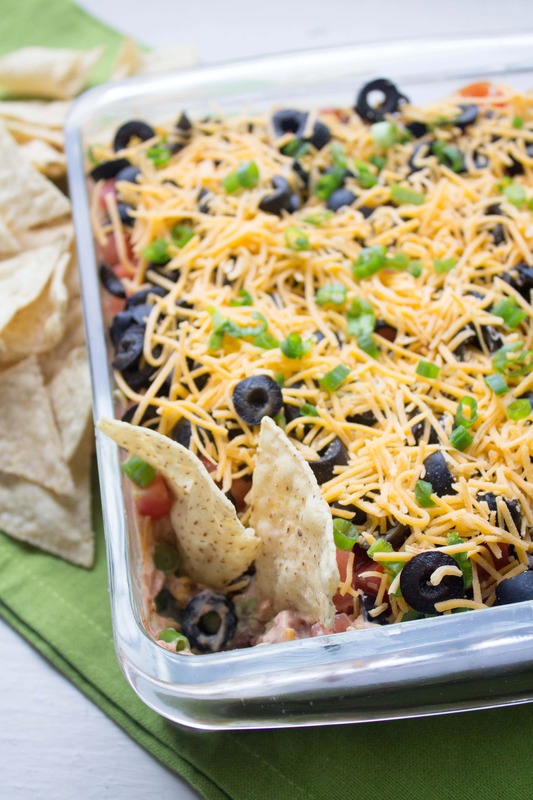 So glad I found your recipe for a healthier 7 layer dip, it’s been a hit at both Super Bowl and Memorial Day gatherings. I’ll be sharing this recipe with those who have loved it as much as I have. Thanks so much for sharing ! I’m glad you liked it! Thanks for sharing! Just made this for a party tomorrow and I tried some already. So great! Thanks for posting! How many calories are in this and what is a healthy thing to use for chips? I don’t recommend calorie counting so I don’t include it for my recipes. You can calculate it if you like at SparkRecipes.com! For chips, I like the blue corn chips. Crackers are also good here – the Blue Diamond nut thin artisan crackers are really good. LOVE THIS RECIPE. I’m only like 13 but my mom was really sick and I decided to volunteer and make Lunch .Dinner was on my sister. It was amazing we always have 2 bags of tortilla chips lying around aannnd we finished it all! Thx for sharing my friends liked it to. I’m glad you all enjoyed it! Is this a 21 day fix recipe? If so, how do you count? Sorry, I’m not familiar with the 21 day fix so I don’t know! This looks really tasty, and I’d like to make it for this coming Sunday’s Super Bowl party. Does it hold up well if it’s made the night before? Or is better if it’s only been chilled for a few hours? I’d probably just do a few hours so it doesn’t start browning! Good thinking! Thanks for the reply! I am so late to this, but I was just wondering how many calories this recipe has?It’s okay if you don’t know! I haven’t calculated it – sorry!